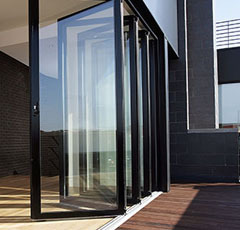 Tunnel Glazing offer a wide range of fantastic quality bi-folding doors, which come in a variety of styles and finishes. They can be made to fit any desired sized opening by adding or removing panels. 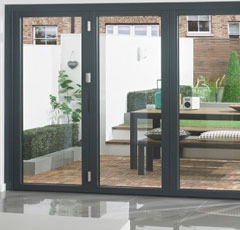 Our range of bi-fold doors come in two frame options, UPVC or aluminium, which each have their own set of finishes. 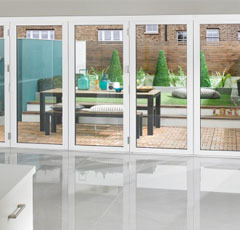 To match your home perfectly our bi-folding doors come with a large selection of glass styles. This allows for complete customisation for every customers needs. Our bi-fold door glass is energy efficient because we use the top of the range ultra strong sealed units, this means your home will be cooler in summer and warmer in winter. Our Staycool double glazing is now standard on all our aluminium folding sliding doors. This offers an exceptionally low 1.1 U-value ensuring max heat is retained in the cooler months of the year. The benefits of Staycool also provide shelter from direct sunlight in the summer months by reflecting 57% of direct heat from the sun and reduce glare by 35%. Staycool is also a neutral solar control glass and does not have a coloured tint. Our bi-folding doors are fitted with high security locking systems to ensure your peace of mind. For doors without a traffic door operation of the shoot-bolt locking system, is only accessible from the inside using the key operated lockable meeting stile twist handles. Doors with a traffic door will have a lever handle operated multi-point hook lock system fitted similar to a normal entrance door. The handle also includes a profile key cylinder deadlock facility which is accessible from both inside and outside enabling a conventional entrance door facility without opening up the complete door. choices: black, grey and white. Other colours on request.